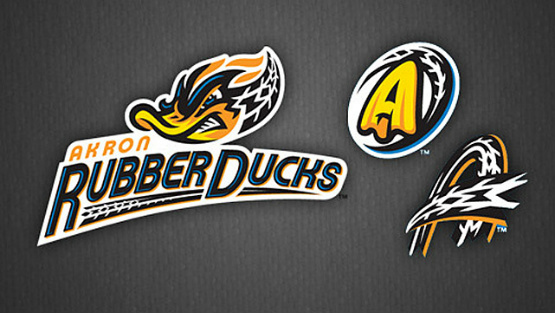 Early this week, another bomb shell was dropped on Minor League Baseball, as the Akron Aeros officially changed their name to the RubberDucks. The name was changed to honor the birth of the rubber industry in Akron, mainly the tire and rubber companies like Goodyear, Firestone, Goodrich, and General Tire that originated there. It is a neat, original logo, and I do like the fact that it relates to the history of the town. 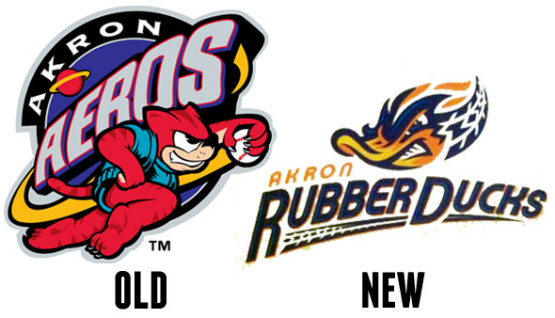 The team was named the Akron Aeros from 1997-2013. The franchise originated in Lynn, Massachusetts before moving to Burlington, Vermont. The team finally ended up in Canton, OH, as the Canton-Akron Indians in 1989, an affiliate of Cleveland. The team moved up to Akron in 1997, and was re-named the Aeros after astronaut Judith Resnick, a native of the city who died in the Space Shutter Challenger tragedy. The team has won the Eastern League championship seven time in its history, dating from the beginning of the franchise (1984, ’85, ’86, 2003, ’05, ’09, ’12). The Aeros’ mascot is named Orbit, and he stated he’ll be sticking around, but I assume they’ll have another duck themed mascot with the new moniker. As of now, Akron is the last game we’re scheduled to see on next years baseball trip. They seem to have many interesting concession items (like the Nice2Meat you, a hamburger/hot-dog combo) that I’m sure we’ll enjoy. With all of the history in Akron and Canton, it should make for an enjoyable trip.